People & Prairies: This three-part series highlights people making a difference in prairie preservation. Photo above by Amy Martin. 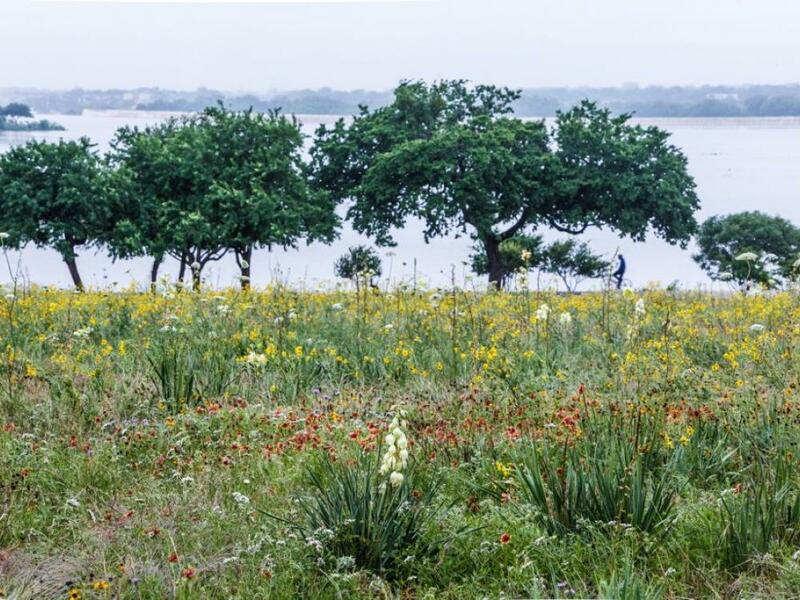 In this first installment, we meet a woman whose passion for Texas and its history saved a prairie from urban encroachment. Susan Roberts marches across the Mathews Cartwright-Roberts Prairie, trailed by a dozen grassland groupies who hang on every word. I am one of them. Feisty and opinionated, she strides confidently, a long white ponytail swinging out the back of a ball cap. I totally want to be her in ten years. 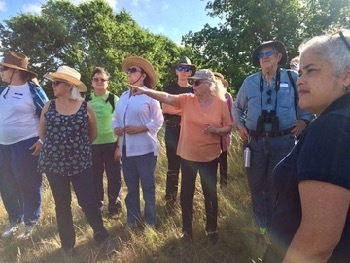 Susan Roberts, pointing, gave prairie enthusiasts a tour of her family property in June. Photo courtesy of Stalin S M.
Roberts has Texas deep in her genes. Her ancestors include a scout for Andrew Jackson in the Mexican America War, a pal of Stephen F. Austin and the largest landowner in state of Texas, back when land was granted in leagues. Family papers reside in the Dolph Briscoe Center for American History in Austin. 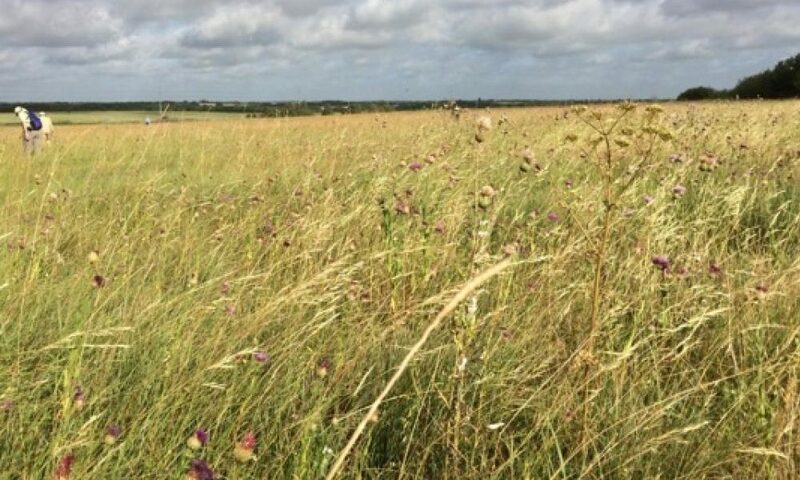 Also in her family tree is Paul Mathews, whose eponymous prairie in Hunt Countywas saved for posterity by a Native Prairies Association of Texas campaign last year. For Roberts, family history and the history of prairie are “hand in hand.” Her family roots are as deep as the native grass roots beneath her feet. 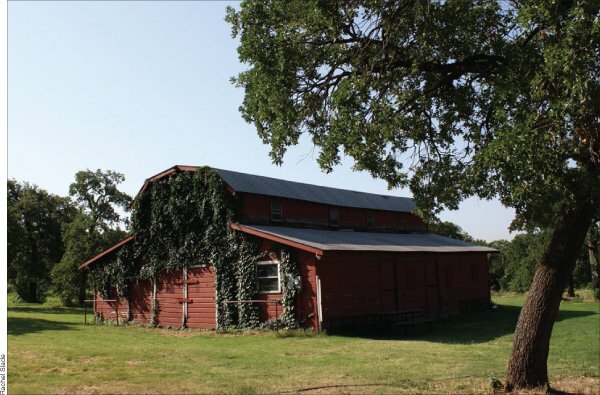 Her 200 acres of Blackland Prairie outside of Terrell looks much as it did when her grandfather roamed it as a young man. 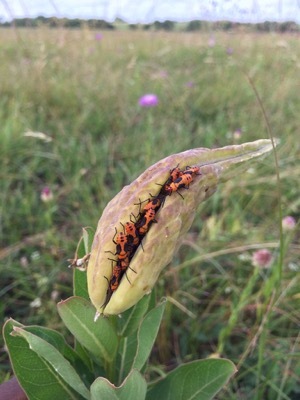 Participants in the Third Annual Northeast Texas Prairies Tour, presented by the Blackland chapter of Native Prairies Association of Texas in June, are lucky. Access to this private prairie is infrequent. About four-dozen people spill out from the bus, pause for a moment with awestuck expressions, and head toward their bliss. Watch this video panorama of the Mathews Cartwright-Roberts Prairie. By Amy Martin. Some strike out for a pond in a low swale. Roberts used to endure trespassers who cut fences and drove their pick-ups across rare prairie plants to fish in her pond. 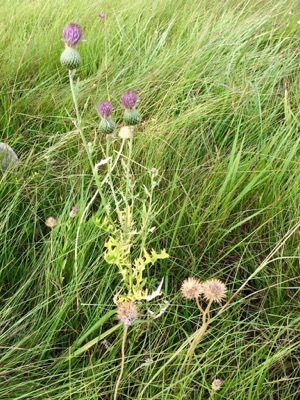 So she allowed it to fill in, forming prairie wetlands that foster unusual species. Geology freaks lope down the slope to the gilgais, raised formations that occur over centuries as the clay soil shrinks and expands. 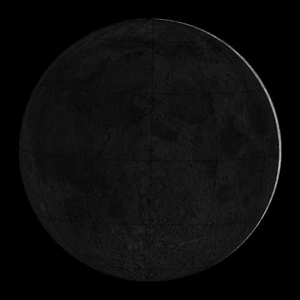 Unlike the more common circular gilgais, these stretch linearly like low earthen waves. The rest of us follow Roberts like puppies, peppering her with questions. She teaches about her four types of soil that foster a diversity of native grasses and forbs rivaling The Nature Conservancy’s Clymer Meadow. 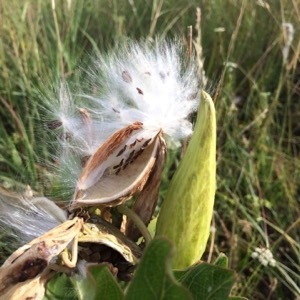 Antelope horn milkweed seeds. Below American basketflower. Photos by Stalin SM. Our prairie group walks through eternal art, a living composition that transforms weekly. The graceful teal of emerging bluestem frames the complex white puffs of Barbara’s button (Marshallia caespitosa) swaying on leafless stems, its light fragrance the apex of femininity. The festoon of filigreed mimosa leaves and round airy orbs of yellow puff (Neptunia lutea) epitomize grace. Standing hip-deep in big bluestem (Andropogon gerardi) and Indiangrass (Sorghastrum nutans), enmeshed in networks of plants and fungi unchanged for thousands of years, Roberts motions to the houses to industry that encircle her property. Development pressure “is an absolute nightmare,” says Roberts. 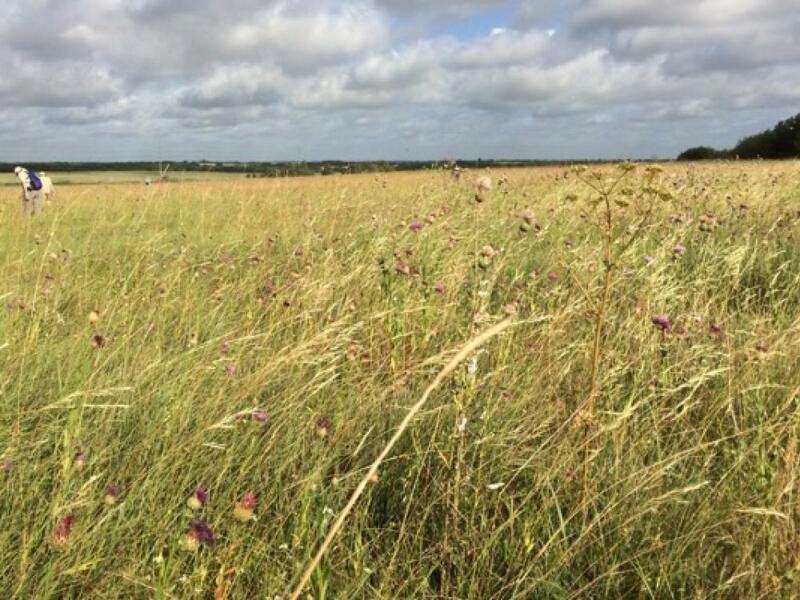 The plan dictates that Matthews Cartwright-Roberts Prairie should be protected from development pressures and given more municipal support, along with the Walter C. Porter farm, where Texas A&M’s AgriLife extension programs began. And here we are, #501.